26.2 Quest: I Have Been Published - In Print! I Have Been Published - In Print! 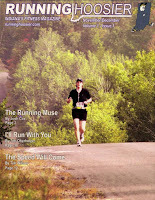 I was just recently excited and very honored to be published in a New Printed Running Magazine, the Running Hoosier. When I was approached with the opportunity I was nervous, but also more than willing to take on the challenge and see where it would lead. We were able to see the first steps pay off in mid November when the first issue was hot off of the press and hitting the streets. My first article in the first issue was titled "The Speed Will Come" and is about trying to run too fast too soon and what can happen when you do so. I just had a real life example of this yesterday when I saw a friend of mine on crutches. She had tried pushing herself too hard and ran too fast and ended up with a stress fracture. More information on how to subscribe can be found on the magazines website, or if you live in either Northern Indiana or Southwest Michigan you can pick it up locally at one of these ever growing locations or at a local race. It was very interesting for me to read the article. Thank you for it. I like such themes and everything connected to this matter. I would like to read more soon. What Happened To My Hamstring?